pre 1800 Roman coins found in the garden. The timbers in the roof are from before the chimney era, with smoked rafters and purlins. 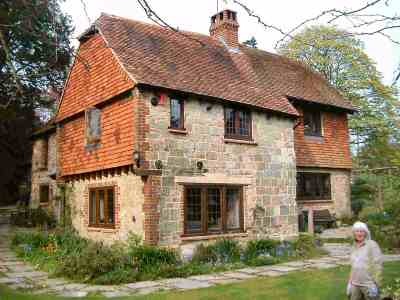 There is evidence of an oak framed house that was replaced by a stone building possibly in the sixteenth century using ashlar Fittleworth stone on the south facing front walls. and they may be Roman. The window apertures were filled in with ashlar stone to avoid the window tax of 1795. 1841 Census records show that the house, then called Nutbourne Manor House, was home to William and Caroline Souter (shoemaker) and their daughter Charlotte. A journeyman and two apprentice shoemakers also lived with the family. 1851 William and Caroline Souter's family had grown to five children Charlotte, Elizabeth, Rosa, William and Thomas and the house was called simply Manor House. 1906-1920 Renovated to provide two bedrooms using the remaining structure by Charles Goode an architect who owned the site and lived at Nutbourne Place a house built on the land of the original Old Manor house. A stone on a filled in west doorway is engraved "LBL refecit A.D. 1906". 1920s Albert, Ede and Dennis Harris. (Ede lived in West Chiltington 1990’s and her family explained about the location of the indoor well that had been capped with concrete). 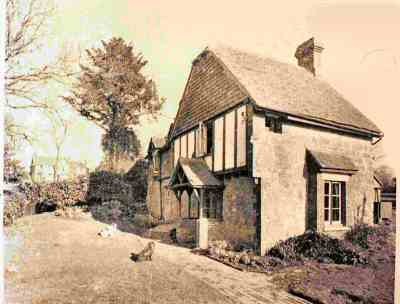 c1962 Now known as The Old Manor Cottage, occupied by Derek Gilbert (landowner and farmer). Mr Gilbert later moved to Florida in 1999. 1972-1995 John Lang, a Barrister, and his wife Tessa renamed the house The Old Manor Cottage and set about modernising the house and relaying the garden to a very high standard, specialising in alpines. The garden was later opened under the National Gardens Scheme. Frank Riddle (Motor Engineer - motoring legislation compliance; car production ), his wife Erica and sons Paul and Simon renamed the house The Old Manor. Most of the previous earlier 1970’s modernisation has been removed to cure damp and decay, while original features including the indoor well, inglenooks, window and floors have been restored. The rear garden has been restored as a traditional kitchen garden. A bottle dump was excavated. Above the west doorway a stone that is engraved "FR refecit MMIV" has replaced a decayed wooden (possibly shop) sign. Refecit is latin for renovated. This elegant house remains one of Nutbourne's treasures. The picture shows the layout of The Old Manor House after the renovations of 1906, which were commemorated with a date stone in the west wall. This look was retained until 1972. The west wall and dormers in the picture are similar to those of The Camber over opposite. 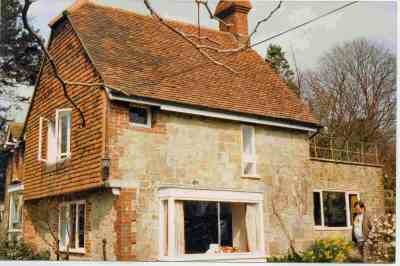 The house after modernisation works were completed in 1975 on behalf the owners John and Tessa Lang. The Old Manor House, restored and resplendent in 2004. Few would believe, seeing The Old Manor House today, that the building has survived at least two periods of dereliction, renovation and alteration. In the roof space there are signs from pre-chimney era, with greasy smoked roof timbers from a timber frame 'Hall House'. It is believed that this was replaced in around 1560 by a large, ashlar stone manorial building. Some of the windows were later bricked up to avoid the hated Window Tax, while for much of the nineteenth century it was home to the local shopkeeper and his family and apprentices, before falling out of favour and standing empty and derelict. It was restored in 1906, providing a small two bedroom dwelling until 1972 when work started on a major remodelling and extension. In retrospect, while original stone was used for the work, some of the original features were hidden or lost, and the modern building materials employed proved less resilient and ultimately unsatisfactory. Since 1995 The Old Manor House has been painstakingly restored, removing modern cement and plasterwork, reinstating the look and style of the windows and even revealing the original well in the garden, which has clear, sparkling water at a depth of around thirty feet (9 metres). Inside, along with the original features, the property includes a modern office from which the owner has been able to help leading motor manufacturers, including Aston Martin, Saab and Renault to ensure that their vehicles comply with the latest legislation. The husband and wife team play a leading role in the well-being of the local community.